Pietermaritzburg is the capital and second largest city of the province of KwaZulu-Natal in South Africa. It was founded in 1838. Popularly called Maritzburg, and abbreviated PMB, it is home to a campus of the University of KwaZulu-Natal, and is a major producer of aluminium as well as timber and dairy products. It had a population of 228,549 in 1991; the estimated current population in Msunduzi Municipality is between 500,000 and 600,000 (between 25% and 30% Indians and whites). 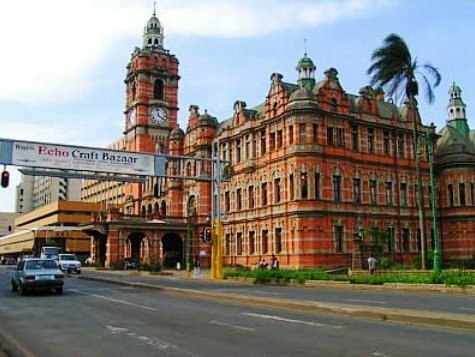 With a proud past, the city of Pietermaritzburg is a thriving, modern capital that has carried its history fully into the present, yet still encompasses a picturesque country feel. It plays host to spectacular sports events, annual outdoor festivals and an agricultural show without parallel on Africa's east coast. It’s a regional hub for higher things: education, arts and government. Hotels, nightclubs, restaurants and bed & breakfast establishments cater for every tourist need. It is a dynamic commercial, educational and industrial centre, with companies that are relocating into its orbit, drawn by a quality of life not easily obtained in South Africa’s larger cities. 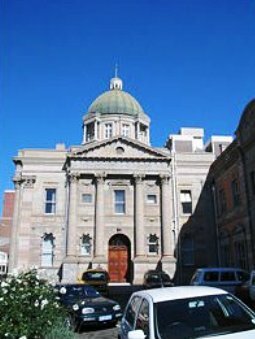 Pietermaritzburg’s City Hall, constructed in 1893, was destroyed by fire in 1895, and rebuilt in 1901. This magnificent example of Victorian architecture is the largest red-brick building in the Southern Hemisphere. The city was originally founded by the Voortrekkers, following the defeat of Dingane at the Battle of Blood River, and was the capital of the short-lived Boer republic, Natalia. Britain took over Pietermaritzburg in 1843 and it became the seat of the Natal Colony's administration, with the first lieutenant-governor, Martin West, making it his home. Fort Napier, named after the governor of the Cape Colony, Sir George Thomas Napier, was built to house a garrison. In 1893 Natal received responsibility for their own government and an assembly building was built along with the city hall. In 1910, when the Union of South Africa was formed, Natal became a province of the union, and Pietermaritzburg remained the capital. Pietermaritzburg, set amidst forested hills and the rolling countryside of the Natal-Midlands, is one of the best-preserved Victorian cities in the world. The city is the administrative capital of the province and is centrally situated between Durban, the Drakensberg and KwaZulu-Natal’s game reserves, on the main N3 highway between Johannesburg and Durban; Pietermaritzburg is approximately 80km north of Durban by road. Pietermaritzburg is the gateway between Johannesburg and Durban and many bus services, rail services and taxis are available on a daily basis. The passenger rail system in Pietermaritzburg is not used between suburbs, but only between towns along the N3 highway towards Johannesburg, so remember it is not regarded as city transportation. 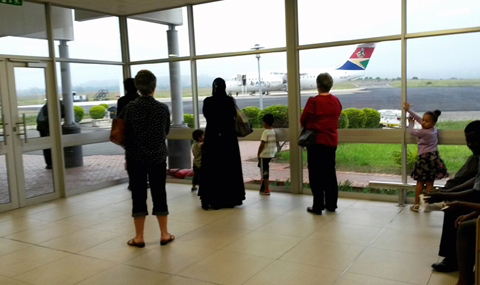 The city offers an airport known as Pietermaritzburg Airport. This airstrip is not an international airport but offers excellent national destinations and inter-city flights. The bus services are pretty good, as you could choose from many different routes and several companies provide a great service. Taxis are plentiful and provide helpful information and useful trips around the city and suburbs. Metered taxicabs operate in all major cities and towns. You will find taxi ranks at transport terminals, major hotels or shopping centers or you can hail taxis in the street. There exist two interpretations about the origin of the city's name. One is that it was named after Piet Retief and Gert (Gerrit) Maritz, two famous Voortrekker leaders. The other is that it was originally named after Piet Retief alone, since his full name was Pieter Maurits Retief. Retief was killed by Dingane, successor to Shaka, king of the Zulus. Maritz died in battle with the Zulus at Bloukranz, some hundreds of kilometres further North and so did not ever reach the Pietermaritzburg area. In 1938, however, the city announced officially that the second element, Maritz, should also honour Gert Maritz. At the time of the rise of the Zulu Empire, the site that was to become Pietermaritzburg, was called Umgungundlovu. This is popularly translated from Zulu, as "Place of the Elephant", although it could also be translated to mean "The elephant wins". Umgungundlovu is thus thought to be the site of some Zulu king's victory, since "Elephant" (Indlovu) is a name traditionally taken by the Zulu monarch. Legend has it that Shaka had his warriors hunt elephant there to sell the ivory to English traders at Durban (then called Port Natal). Today, the town is still called by its Voortrekker name, although the municipality it is part of bears the Zulu name. During apartheid, the city was segregated into various sections. 90% of the Indian population was moved to the suburb of Northdale while most of its Zulu inhabitants were moved to the neighbouring township of Edendale. The University of Natal was founded in 1910 as the Natal University College and extended to Durban in 1922. The two campuses were incorporated into the University of Natal in March 1949. It became a major voice in the struggle against Apartheid, and was one of the first universities in the country to provide education to black students. This campus boasts association with a remarkable array of world-class academics and has famous alumni distributed throughout the world. It became the University of KwaZulu-Natal on 1 January 2004. Pietermaritzburg is also famous for an incident early in the life of Mahatma Gandhi. In May 1893, while Gandhi was on his way to Pretoria, a white man objected to Gandhi's presence in a first-class carriage, and he was ordered to move to the van compartment at the end of the train. Gandhi, who had a first-class ticket, refused, and was thrown off the train at Pietermartizburg. Shivering through the winter night, in the waiting room of the station, Gandhi made the momentous decision to stay on in South Africa and fight the racial discrimination against Indians there. Out of that struggle emerged his unique version of nonviolent resistance, Satyagraha. Today, a bronze statue of Gandhi stands in Church Street, in the city centre. The first newspaper in Natal, the Natal Witness (now known as The Witness), was published in 1846. The 46 hectare Botanic Gardens were created in 1872 by the Botanic Society of Natal. 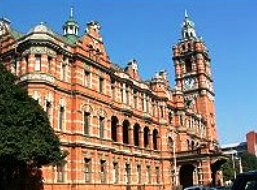 The city hall, which is the largest red-brick building in the Southern Hemisphere, was destroyed by fire in 1895, but was rebuilt in 1901. The British built a concentration camp here during the Second Boer War to house Boer women and children. In 1962, Nelson Mandela was arrested in the nearby town of Howick to the north of Pietermaritzburg. The arrest marked the beginning of Nelson Mandela's 27 years of imprisonment. A small monument has been erected at the location of his arrest. 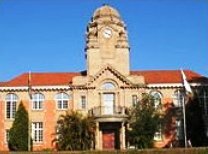 Pietermaritzburg has a high concentration of attractions linked to its various skeins of history than any other city in South Africa. One of the best ways to bring local history alive, is with one of the self-guided Town Trails. These are easy, comfortable walks through the city's historical centre - which includes 50 national monuments. The city has gone to great lengths to maintain its red-brick charm and authenticity, and outstanding among the many Victorian and Edwardian buildings is the City Hall. Built in 1893, it was destroyed by fire in 1898, rebuilt, and reopened in 1901. Considered the largest all-brick building in the southern hemisphere, it stands on the site of the original Voortrekker Raadsaal, and was declared a national monument on 27 June 1996. It houses what is to be reputed to be one of the largest organs in the southern hemisphere, and this magnificent instrument is still in demand for recitals and concert recordings. The 47m clock tower stands out as a landmark in the city centre, making it a useful point for an exploration of the city. On the same square as the City Hall, stands the Church of the Vow, built by the Voortrekkers in 1840, to commemorate their victory at Blood River in 1838. The church is now part of a Voortrekker Museum, with a unique and varied collection of Voortrekker relics. This historical building stands alongside the rebuilt house of Voortrekker hero Andries Pretorius. Mahatma Gandhi is woven into the fabric of Pietermaritzburg history. A striking statue in the Church Street Mall depicts him forever striding forward, in commemoration of the incident in 1893, when he was evicted from a first class railway carriage at Pietermaritzburg railway station. The Parliament Buildings in Longmarket Street are deeply rooted in history. The foundation stone was laid on 21 June 1887, to commemorate Queen Victoria's Jubilee. Its soaring columns and copper domes reflect the grandeur of the colonial past. The central city shopping area, intersected by a network of character lanes, is a pedestrian treat. Dating back to 1838, it was surveyed by Piet Greyling and is reminiscent of Victorian London. Specialist shops - Africana collectors are frequent visitors - and cafes invite browsing. Look out for the hitching rails outside the Imperial Hotel, where Napoleon is said to have tethered his hose, as well as the handsome style of the Standard Bank building. Prior to the end of apartheid in 1994, Pietermaritzburg was the capital of Natal Province. Following the first post-apartheid elections in South Africa, as a result of which the Inkatha Freedom Party won a majority in the KwaZulu-Natal provincial government, Pietermaritzburg shared its status as capital of the (then newly-created) province of KwaZulu-Natal with Ulundi. Pietermaritzburg became the legislative capital of the new province, while Ulundi became the administrative capital. The IFP, being strongly Zulu nationalist, desired that Ulundi, the capital of the Zulu Kingdom at the time of its fall to the British in the Anglo-Zulu War, be the post-apartheid capital of the province. Ulundi had also been the capital of the bantustan, KwaZulu, which makes up a portion of modern KwaZulu-Natal. However, Ulundi severely lacked the infrastructure to be an effective seat of government, and the African National Congress (ANC) and the Democratic Party, the two other strong political parties in the province, among others, called for Pietermaritzburg alone to be the capital. The debate came to an end when the ANC came to power in the province in 2004, and named Pietermaritzburg the sole capital of KwaZulu-Natal. This has resulted in the relocation of several government offices to Pietermaritzburg. This has generally been welcomed as a positive development for the region. Since 2004, progress such as the modernization of several buildings in the city centre and a proliferation of retail and housing developments in the suburbs are results of recent investment in the city by both the public and private sectors.